CaptivArting is my "catch-all" site for the work I've done as a (relatively) new teacher in San Diego County. So far I've worked two full years on contract (2010 - 2012) two half-years on temporary replacement contracts (the second half of 2013 and 2015) and two years on a variety of substitute teaching (all the time between 2012 & 2014). As a way to keep developing content, during the "off-season" (mostly summertime), I began a new blog I'm calling "PhotoJournal" which will be updated a few times a week, with ideas for lessons, sketches of projects I'm working on, and other Art & Design-related information I find relevant to my progress in teaching. This site is constantly being updated during the school year as an example (primarily in content) for the expectations I assign my students for their sites. There are links to specific schools where I've either substituted, had a short-term contract, or full-time contracts. I've also got links to the various sites that show-case student work.. There are also tabs ("Lincoln" for instance) created for a week-long substitute teaching assignment I had at Lincoln High School in September 2013, wherein I had those students create a website using Weebly.com. A copy of the "Favorites" (Information Sheet) can be downloaded by clicking this link. 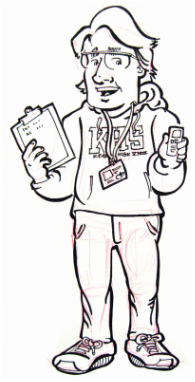 Self-portrait cartoon, holding my ever-present clipboard and digital mp3 recorder.